Linda Zelenka, former MUIP coordinator for the NE district. 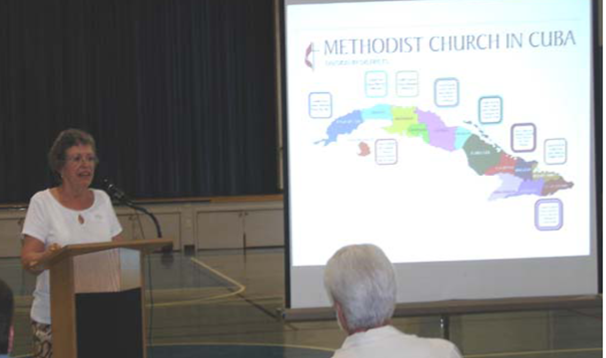 I have long wondered about our relationship with the churches in Cuba. What is it? What draws us to untangle bureaucratic tape for months just to get there for one week. What makes almost all first time travelers come home with one question? When can I go back? What made me on my way home in the Havana airport place my hands on the great iron door that had just clanged shut against me. What made me unsure as to who was shut in and who was shut out? Cuba is spiritually disorienting. What is it? Too many miracles? There is something. I want to tell you about Ana Marie. I met her on my first trip to Cuba. We found ourselves sitting together in a bus crammed ear to elbow on an evening trip to Morro Castle with the church. The bus was rattling, exhaust-filled, and the din of laugher and fun was deafening. So it was tricky for Ana Marie and I to talk, especially as her English and my Spanish were minimal. But talk we did. Ana Marie was 15, beautiful, bright, and blind. She had learned Braille and her dad had seen to her English lessons. On the way back from Morro that night everyone is the bus sang, something, and so did we. We sang the two English songs she knew, and the two Spanish songs I knew. Hers were “Happy Birthday to You” and “10 Little Indians.” Mine were “Cielito Lindo,” and one verse of “Alla en el Rancho Grande.” Then and there Ana Marie and I were friends. When I got home to the U.S a man in our congregation spent almost a year seeking a Braille Bible in Spanish to send to Cuba in honor of Ana Marie. He found one. The Bible arrived at our church, in 25 large boxes. We managed to get the post office to deliver them because of the content, each box stamped “For the Blind” in Spanish. Off they went. Not one single box made it through. Not one. The day we had mailed them, I got home from the post office and found I had overlooked a box. I decided just to take it in myself instead of mailing it. That fragment was the only part of the Bible left for Ana Marie. But, we know what God can do with a remnant. Months later I carried the box through Havana customs. That night the pastor and I presented it to Ana Marie in the worship service. She was overjoyed. We explained to the congregation what the strange-looking volume was and opened it for them to see. The sight of a huge book with blank pages was astounding even with the tiny perforations. “Nada,” I heard. “Nada.” It seemed utterly empty. It was empty -- for us. Then we asked Ana Marie to read. And she, who had never stood before the church nor ever read the Bible herself, stood up before a room full of people she could not even see, and she read. Balancing the enormous book on one hand, and sweeping her fingers across the pages, Ana Marie read. When she stopped, the congregation burst into applause and rushed to her side with hugs and kisses and tears. The blind had seen. In all my visits to Cuba I had multiple gracious encounters with God: one common miracle after another. What is this Cuban Church? I think the Cuban Christians are Peter for me, walking on water. All the disciples were in the boat in the storm when Jesus came toward them walking on the water. All were afraid. But Peter said, “Lord, if it is you, tell me to come to you on the water.” Jesus said, “Come.” And Peter went. He walked on the water. Yes, he sank, yes, Jesus scolded him. But he came. He got out of the boat and walked on water. The other disciples did not walk on the water. But they did see Peter do it. And so ever after they knew as we know, in no uncertain terms, that it is possible. In my eyes, when the Church in Cuba hears Jesus say, “Come” they come. When the Spirit calls them to pray, they pray. When the Spirit calls them to make music, oh they do. And when a shy blind girl is called to stand up and read, she rises and reads. And the springs of living water flow. I have been in the boat with Peter when I was with my sisters and brothers in Cuba, and because I have witnessed them, I know more of what is possible.